Chloé will launch Nomade, a new fragrance for women, in February. Nomade will be fronted by actress Ariane Labed. The floral chypre fragrance was developed by perfumer Quentin Bisch. The notes include oak moss, Mirabelle plum and freesia. With the first fragrance, it’s all about the purity, naturalness of the Chloé girl’s attitude. This one is more about [her] daring and adventurous side. [...] It’s all about crossing the next frontier, always pushing the boundaries of who you are. 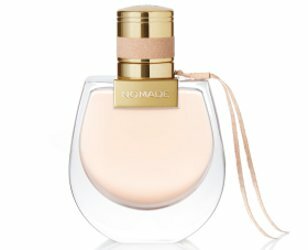 Chloé Nomade will be available in 30, 50 and 75 ml Eau de Parfum ($75 - $132). The bottle shape was inspired by the brand's Drew shoulder bag. The new Chloé fragrance revisits the iconic chypre structure in a definitively Chloé clean, floral way with notes of oak moss, freesia, and Mirabelle. There is also a 10 ml travel spray for $28. That bottle is lovely, and the notes sound promising. Parure reborn, perchance? I will be shocked if it is that much of a chypre, but we’ll see! The bottle really is quite nice. Yes — I like it better than the Chloe EdP, although that was nice too. Anything with oakmoss in it is a plus for me! Sounds promising! Mr. Bisch does good work……I’ve been a fan of his ever since that BBC documentary on perfume! Me too! I’m cautiously hopeful he’ll do something good with this. I was recently admiring that purse (but not the price: even if I had 2K to spend on it, where would I use it – going to the office or grocery shopping? ); so now understandably I like this bottle. It should look really nice in 30 ml. I’ll give it a try when I see it but I don’t expect to like it enough to buy. Ooh, I love the looks of that bottle! I was reminded of Love, Chloe yesterday. I should wear it soon. It’s one that I love but overlook. Looks like heavy glass which I love, I believe it’s going to be a great fragrance! I do not feel as hopeful as most of you for this one. Chloe has not done a very good job in modern times. Also, is that the same CEO who quipped about taking 6 months for finding the original ribbon? Sorry for being grumpy. I actualy like pink, but it is sooo over used. I like those Chloe bottles, alas the juice is not working for me. Hope the cap doesn’t tarnish like my edp did.